I blame Toby Hadoke and Rob Shearman. I was reading their wonderful Running Through Corridors book when I was inevitably inspired to watch Doctor Who from the beginning again. I’ve attempted this feat several times before, of course, but I usually crumble in the middle of The Sensorities, and if I cheat and jump to a Pertwee, it’s always Colony in Space that finishes me off. My methodology was probably at fault (that and the sheer awfulness of The Sensorities). I would stay up late, always alone, and I’d watch a handful of fuzzy Hartnells in irregular, sporadic bursts. Was it any wonder I lost the will to live? And then I remembered my friend John Williams telling me that Andrew Pixley managed it when he rationed himself to a single episode a day. He would watch it while he was having his tea. The thought of experiencing the classic adventures like this sounded irresistible to me. And since there’s bugger-all on the telly at 7pm, it felt like the ideal time slot, too. All I had to do was convince my wife to let me take over the living room for 30 minutes each day. And then, entirely on a whim, I decided to push my luck. Why not ask my wife to join in? 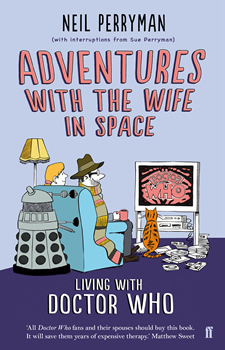 Incredibly, brilliantly, and rather worryingly, my wife not only agreed to watch every episode of Doctor Who with me, she promised to give it her undivided attention, too. She even agreed to switch off her precious mobile phone. She didn’t ask for anything in return. I thought this might be worth chronicling for a blog, so I asked her if I could record and publish her reactions as a non-fan as we went along. What I didn’t tell her is that if people actually read these mini-reviews, I’d be able to guilt-trip her into continuing when we hit our first bump in the road (next week, probably, as we get bogged down in Thals). I have subjected Sue to classic Doctor Who before. When we met in 1993 it didn’t take her long to realise I was a fanboy. It was probably when I started frothing at the mouth when I discovered she had UK Gold back at her place. I knew the channel was broadcasting late night Jon Pertwee repeats (most of which I hadn’t seen since childhood), and I would have killed for an opportunity to see some. Not that Sue ever watched these episodes with me – not even during our honeymoon period. Thanks to a long and complicated series of events involving her parents and some lodgers who stayed longer than expected, I had to sleep downstairs with her dogs for the first few weeks of our relationship. Their gastric problems (the dogs, not the lodgers) threatened to drive me away on more than one occasion, but Pertwee always coaxed me back. When I moved in with Sue and her daughter, Nicol, a few months later (Monday 5th July, 1993 – you don’t easily forget the black and white opening to Invasion of the Dinosaurs), my overflowing cardboard boxes full of videos, Target novels and back issues of DWM made it perfectly clear I was more than a little interested in the programme. It didn’t take me long to instigate an all-too-familiar gamble and casually suggest we watch a couple of stories together. You know, just in case she liked it. I’d already failed with the programme’s intended target audience. Nicol was almost five when I moved in, but the programme didn’t appeal to her in the slightest. I tried every Doctor possible, and while she would happily laugh at Jon Pertwee’s lisp, she couldn’t wait for me to switch it off. A couple of years later, she had to complete a school project about the Aztecs, and even that didn’t work out. In the end, I just had to accept Tom Baker couldn’t compete with Sabrina the Teenage Witch. Sue’s memories of the classic series were practically non-existent when I met her. She didn’t watch the programme when she was growing up, and while she knew what a Dalek looked like, and that the TARDIS was bigger on the inside, that was about it. And so, after many hours of careful deliberation, I subjected her to The Caves of Androzani. It felt closer to modern television than the rest of my Doctor Who VHS collection, even the episodes that were still less than five years old at the time. There was also the added bonus of an unexpected regeneration that would hopefully prove to her our beloved programme could be unpredictable, exciting and moving. She thought it was ‘okay’. A few days later, I wheeled out the big guns and we sat through Genesis of the Daleks in one sitting. She loved it. I had to rub her feet through Parts Three to Five, but it was worth it. Knowing me, I probably pushed my luck with something edgy or bleak, like Ghost Light or Kinda, but my memory is a little fuzzy here. I do remember she would occasionally acquiesce to the odd UK Gold repeat (I have a very vivid memory of her scoffing at the Vardans in The Invasion of Time: Wednesday March 2nd, 1994 at approx 11.50pm), but nine times out of 10 she’d head to bed and leave me to it. Not that she’s ever sneered at my passion for the programme. She’s never told me to hide my videos or books away in the attic, she’s bought plenty of Doctor Who themed tat for me over the years, she’s never chided me for wearing a t-shirt with Tom Baker beaming out from it, and she even rang him up on QVC so she could baffle him with a question about Big Finish (which I was too scared to ask myself), even though my wife didn’t have the faintest idea who or what Big Finish was (or is). In summary, Sue tolerates the classic series but she wouldn’t be able to tell the difference between a Patrick Troughton-era Cybermen and a Peter Davison one, as a recent trip to ASDA sadly proved. She does like science fiction, though, and unless she’s been lying to me for the last 18 years, she enjoyed Star Trek: The Next Generation (she liked Data a bit), Babylon 5 (she fancied Bruce Boxleitner a lot) and Buffy the Vampire Slayer (we named a dog after her). More recently, she’s been an avid viewer of Battlestar Galactica, Caprica, Fringe, and Lost. Oh, and she’s lovely. Have I mentioned that?